For a good idea of what you will experience please read our REVIEWS and see for yourself why our guests keep coming back (4.8/5 stars)! We offer great value and a quality experience in a dynamic neighborhood that is quiet, close to downtown with many of Montreal’s top restaurants. GALLERY 3 is a fully furnished apartment on the second floor of our meticulously restored century old building. Strategically located 5 minute walk from Place St-Henri subway (called Metro), the Atwater Market and the historic Lachine Canal. An ideal home away from home in one of the most vibrant hip villages in Montreal called St-Henri. Parking is free in the streets in front and around the building. This two bedroom top floor apartment has lots of natural light and sleeps 4 to 6. It is an open kitchen to the dining room, a living room, a master bedroom, a second bedroom and bathroom. It features one queen size bed, two single beds & a sofa double pull-out bed. The kitchen is full equipped with dishwasher. The bathroom has a deep tub with shower perfect to relax after days of sightseeing. Front loading washer/dryer are available in the apartment. You also have direct access to your own a deck with set of chairs, table and BBQ. The perfect place to enjoy the sun and have a feel of the neighborhood! Finished with hardwood floors, spotlessly clean, original art decorated, high quality furnishings & linens. Fans in every room and central AC for comfort. One flat screen HDTV, DVD player, cable TV, Netflix, high speed wifi internet & bluetooth stereo system provided for entertainment. Also comes stocked with books and board games. Deluxe IGA grocery store is only a 5 minutes walk away. We are also located near the delicious Atwater market where you can savor gourmet foods, pastries and deli style food. If you prefer to eat out, we are few minutes walking from some of Montreal’s top restaurants like Joe Beef, Liverpool House, Tuck Shop, H4C, Smoking Vallée or CHO. If you prefer a drink in a hip setting there is La Drinkerie, Grumman 78 or Terrasse St-Ambroise and many others just around the corner. Called GALLERY 3 it is one of three units in our building isolated to minimize noise between levels. Other units are GALLERY 1 (VRBO #211812) with one bedroom & GALLERY 2 (Homeaway #213798 ) with two bedrooms. We have all the city and provincial permits to legally operate so you can reserve with peace in mind. Plus, when you book one week you get one night free! Depending on the season, you could catch a Canadians hockey game at the Bell Center, go rock climbing at Allez-Up indoor rock climbing gym or get to the Lachine Canal 2 blocks away from the apartment. The Canal walk/bike path, is the highway of choice for whoever doesn't travel by car by leading to Old Montreal or the St-Laurence River in just 15 minutes. You can rent a bike, pedal boat, kayak, electric boat or ride in a dragon boat. For small children and family, there is a nice park with playground and splash pad one block away. We also located minutes from George Etienne Cartier parc where there is a station of the city public bike sharing system called BIXIE. Finally, you really get the best of both world being able to get easily to action packed downtown/old Montreal or just walking around our apartment to really discover what Montreal has to offer!! I travel a lot myself renting this kind of properties and always take good notes of every positif aspects to try to incorporate them in our apartments. I always wanted to own a hotel and this about as close as it gets. I enjoy meeting people from all over the world. I also believe that we offer a great value to travellers. We've made our apartments up as if we were renting them ourselves. We take pride on being good hosts and offering you a great stay. We honestly try to make every aspect of your stay a pleasant experience. Great area, good restaurants and we are very close to the subway system (called Metro) downtown reachable in minutes just a couple of station away. Very close to the Atwater market where there is great food and restaurants. We are also minutes from the Canal Lachine which has great bike paths and walking areas that lead to the Old Port of Montreal. Proximity to downtown / Old Montreal, walking distance to the Atwater market, Metro (subway) Place St-Henri, grocery store, lot of really good restaurants and nice pubs. 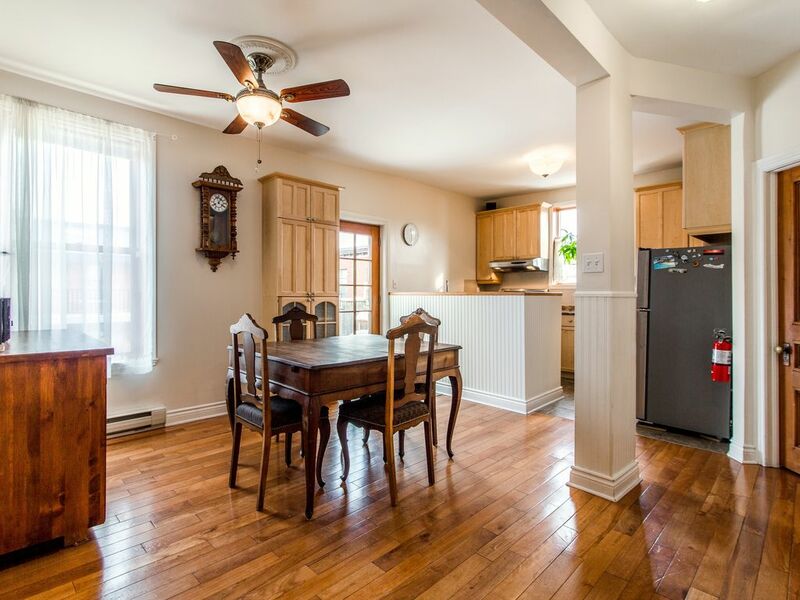 Perfectly located in a vibrant neighbourhood to come and enjoy the real Montreal experience! Bathroom redone in late 2012, new deep tub! Nice tile work (WE NEED TO REPLACE THE PICTURE). A nice evening view of Mount Royal / Westmount. Receives all calls but no long distance calls out. High quality cotton sheets and towels throughout. Also coffee machine, microwave, toaster and coffee grinder, pitcher with water filter. 10' X 12' deck / balcony. Hardwood and ceramic floors, ceiling fans in all rooms. Originally from Montreal, my wife and I took our two teenage granddaughters down to Montreal for a week to celebrate my mother's 90th birthday. The unit was well provisioned, well maintained and the amenities were certainly what we hoped for. The owner was very attentive while leaving us alone to explore the wonders of Montreal. We had a great time enjoying life in downtown. We highly recommend the owner and this unit. Thank you Etienne! We enjoyed our stay very much. The apartment was clean and the kitchen well stocked. We liked being able to bike along the canal to the Marche Atwater for dinner ingredients. We had a great visit. The accommodations were clean and comfortable. We appreciated the use of the bikes as we biked into Old Montreal. We would gladly stay again! This is our second visit to this same property. It has all the essentials including a nice deck to sit out and enjoy a dinner or breakfast (which we did both). It's also close to the supermarket and the Atwater Market which I would highly recommend. There are also some very good well priced restaurants nearby. In addition, you are very close to the train station. It's a good deal for the price, I would definitely recommend it. Overall, we enjoyed our stay. Atwater market is nearby as well as numerous restaurants, parks for the kids, and the Metro station. The apartment is well stocked with kitchen utensils, pots and pans, and small appliances. There are games, books, and dvds in case the weather turns. During our stay it was ridiculously hot (35 C in the kids' room), and the person that manages this apartment was out of town, but thankfully Kieran, the cleaning person, had left his number and came to the rescue with a portable air conditioning window unit. Delay with installation of permanent AC units cause this situation. Portable AC was offered. Three new permanent AC are nkw installed and working. The place is very clean, great kitchen and the balcony is an added bonus. The location is in the heart of an up and coming trendy neighborhood with many amazing restaurants to choose from, grocery stores nearby and the Atwater market within easy walking distance - and the canal and the metro! What more could you ask for?? I give this place a 10/10. My only caution would be that the stairs leading up to this walk up apartment are very steep and would not be good for a family with young children or anyone struggling with mobility issues. WE HAVE GOOD QUALITY ADULT BICYCLES FOR RENT - ASK US.. Absolutely no smoking and no pets allowed in the apartment.